ISO 216 specifies international standard (ISO) paper sizes used in most countries in the world today. It is the standard which defines the commonly available A4 paper size. The underlying principle is that when rectangles with width/length ratio are cut or folded in half the rectangles thus formed retain the original width/length ratio. The international ISO standard is based on the German DIN standard 476 (DIN 476) from 1922. Some of the formats contained therein were independently invented in France during its revolution, but were later forgotten. The aspect ratio used by this standard was mentioned in a letter by the German Georg Christoph Lichtenberg, written on 25 October 1786. A size chart illustrating the ISO A series. Paper in the A series format has a aspect ratio, although this is rounded to the nearest millimetre. A0 is defined so that it has an area of 1 m², prior to the above mentioned rounding. Successive paper sizes in the series (A1, A2, A3, etc.) are defined by halving the preceding paper size, cutting parallel to its shorter side (so that the long side of A(n+1) is the same length as the short side of An, again prior to rounding). The most frequently used of this series is the size A4 (210 × 297 mm). A4 paper is 6 mm narrower and 18 mm longer than the "Letter" paper size, 8½ × 11 inches (216 × 279 mm), commonly used in North America. The formula that gives the larger border of the paper size An in metres and without rounding off is the geometric sequence: an = 21 / 4 − n / 2. The paper size An thus has the dimension an × an + 1. The exact millimetre measurement of the long side of An is given by . A size chart illustrating the ISO B series. The B series formats are geometric means between the A series format with a particular number and the A series format with one lower number. For example, B1 is the geometric mean between A1 and A0. The sides of B0 are 1 m to m.
There is also an incompatible Japanese B series defined by the JIS. The lengths of JIS B series paper are approximately 1.22 times those of A-series paper. The exact millimetre measurement of the long side of Bn is given by . A size chart illustrating the ISO C series. 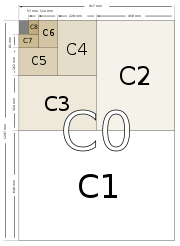 The C series formats are geometric means between the B series format with a particular number and the A series format with the same number, (e.g., C2 is the geometric mean between B2 and A2). The C series formats are used mainly for envelopes. An A4 page will fit into a C4 envelope. C series envelopes follow the same ratio principle as the A series pages. For example, if an A4 page is folded in half so that it is A5 in size, it will fit into a C5 envelope (which will be the same size as a C4 envelope folded in half). A, B, and C paper fit together as part of a geometric progression, with ratio of successive side lengths of 21/8, though there is no size half-way between Bn and An+1: A4, C4, B4, D4, A5, ...; there is such a D-series in the Swedish extensions to the system. The exact millimetre measurement of the long side of Cn is given by . ±3.0 mm for any dimension above 600 mm. Before the adoption of ISO 216, many different paper formats were used internationally. These formats did not fit into a coherent system and were defined in terms of non-metric units. This page was last modified on 21 March 2009, at 11:35.